On the 93 anniversary of Denshway incident, Mrs. Suzanne Mubarak today inaugurates Denshway National Museum in Menofeya governorate. The museum was rebuilt to witness and immortalize the historic story of the Egyptian peasants struggle in Denshway village against the then British colonialism. 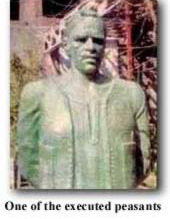 Besides an administrative building, the museum comprises 5 show halls in which all sequences of the historic struggle are represented, in addition to number of sculptures, paintings and a diminutive pattern of the old Denshway village made by the engineer Essam Safyy Al-Dein and the artist Mahmoud Mabrouk. 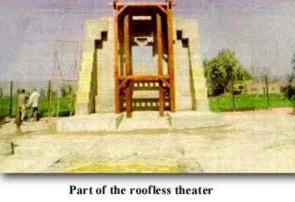 The building also includes a roofless theatre, cultural centre, music hall, VIPs hall and an atelier as well. The museum, built on an area of 2850 sq.m, cost some LE4 million, in addition to some LE1.5 million were allocated to the artistic purposes. 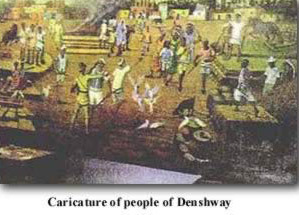 In 1906, Denshway village was under the British colonialism. The British soldiers used to mistreat peasants, take their possessions, burn their crops and kill their children, women and old men as well. Such measures stir up people in Denshway, so, they resisted and revolted, by no weapons but their willingness and faith. First, they were able to make the British soldiers draw back but later, they were faced by different shapes of arbitrariness and many were killed. 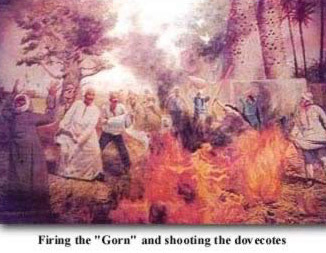 On the other hand, a British soldier died affected by a sunstroke but the British colonists were not convinced by the reason of the death and accused the peasants of killing him. Then there was a trial, a very unfair trial where 4 of the villages youth were executed while many other were put in jail. 32 painters and sculptors were chosen to feature, by their own thoughts, the historic event on all dimensions. 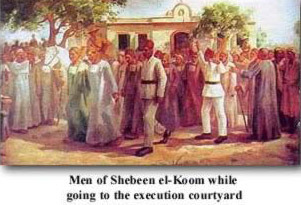 Among the paintings represented are, the two scenes of the trial and the judgment execusion, made by the painter Sabry Mansour, the preliminary trial represented by a committee of a foreign judge, the governor, a lawyer and a clerk, before them stand a number of charged people, made by the artist Ahmed Nabil. Also there are paintings of Mohamed Tarawi, who chose two scenes to depict naming them "Head of guards bleeding and "Sergeant Paul", while the painter Ibrahim Hegazi chose the incidents beginning to be the topic of his painting. All painters, could successfully express the event and could, by their own touches, colors and shadows make us feel as if they were painted at the same time of the event. 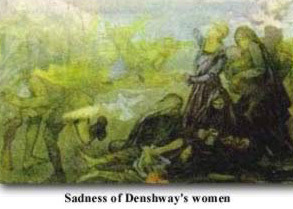 After all, Denshway incident is a very special Egyptian epic of dignity and sacrifice, however, Denshway museum is an important cultural event to put Denshway village among the Egyptian tourist sites.